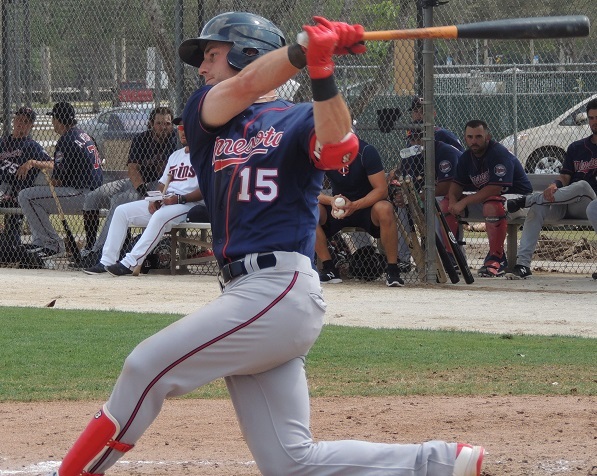 FORT MYERS - 2017 was a fantastic year for Twins prospect Brent Rooker. After being drafted in 2016 by the Twins, he went back to Mississippi State where he won the SEC's Triple Crown, a feat not accomplished in about 30 years. He was drafted again by the Twins, this time 37 rounds higher, and diced to sign. He hit a combined 18 home runs between Elizabethton and Ft. Myers in his professional debut. 2018 could be an even bigger year for Rooker. He is now engaged. He participated in his first Twins Fest in Minneapolis in January. And he is currently participating in his first spring training. Could he be up with the Twins in 2018, maybe 2019? That’s to be determined, but it isn’t out of the realm of possibility. On Monday on the back fields of the Lee County Sports Complex, Brent Rooker played first base for the Chattanooga Lookouts work group against the AA work group of the Boston Red Sox. Long-time big leaguer Chris Heisey came down from big league camp and introduced himself to the Twins 2017 draft pick. As usual in those games, he got a couple of at-bats and played half of the game at first base. He was then replaced by another quality Twins prospect, Lewin Diaz. However, Rooker’s day was not over. After watching an inning of the game, he shifted to the half-field adjacent to the field in which the game was being played. He and fellow prospect Chris Paul went to first base where Joel Lepel hit them ground balls, and they were to throw it to second base. They were working on turning and throwing and other footwork basics. After a while, the were joined by a couple of new Twins instructors. Michael Cuddyer and Justin Morneau found their way over there. Cuddyer mostly observed and later hit fungoes to other infielders. Morneau stood by Paul and Rooker, offering suggestions and even showing the footwork. The opportunity is great for the minor leaguers to learn from such talent. Twins Hall of Famer Torii Hunter has worked with the players. Michael Cuddyer was inducted into the Twins Hall of Fame following the completion of his career. Justin Morneau announced his retirement in January. The former MVP has joined the Twins front office as a special assistant to Baseball Operations. These are guys who have accomplished so much, including All-Star Games in their long MLB careers. To get pointers from them can mean the world. Rooker grew up in a small town, Germantown (TN), just miles from Memphis. His father played baseball at Memphis, and his younger brother is currently on the Memphis team. Rooker headed south a couple of hours and chose Mississippi State for his college baseball. Rooker is a great athlete and participated in three sports during his high school career at Evangelical Christian Academy. Not only did he participate, but he was a team leader in all three sports. The coaches at Mississippi State told him that he would redshirt his freshman season. While it wasn’t ideal and could be frustrating at times, Rooker says it was the best thing for him. “Simply put, I wasn’t ready to compete at the level I needed to to help the team, so the redshirt was the best thing for me. I was told I was going to redshirt. It’s not the most fun thing to do. You have the choice though. I could leave and go to a JuCo and play right away, or I could stick around and try to figure out how to play at this level. I chose to do the latter and it really paid off for me. That year was hard. It was a lot of hard work, and it was tough not to be able to play and compete and practice all the time. At the end of the day, I really needed it and think it was the best decision for me. Following a strong junior year (redshirt sophomore season), the Twins took Rooker in the 38th round. He chose not to sign, betting on himself. He spent a lot of time that summer trying to figure out how to take his game to the next level. Video has become a big part of Rooker’s preparation and work toward becoming a better player. He notes that while he has had favorite players and favorite teams in the past, he now watches baseball players a little differently and has found a couple of guys whose swings he likes and studies. On Sunday, Lance Lynn pitched in a minor league. In that game, Rooker lined a double to left field. The below video was recorded, and it illustrates the results of his work. You can see a nice, efficient swing with little extra movement and a lot of power generated. Later that day, Parker slowed down the video to better illustrate the efficiency. He is working with the Chattanooga group right now, so it makes sense the that organization may plan to have him start the season back in Ft. Myers where he posted a .917 OPS with six doubles and 11 homers in just 40 games in 2017. It’s also possible that he will begin the season with the Lookouts. While we will continue to look at his statistics, Rooker will continue to work on his process. As he said, the numbers will take care of themselves. Could we see Rooker in a Twins uniform, playing games at Target Field by season’s end? The odds probably aren’t high, but the fact that at this time a year ago, he hadn’t even started SEC games yet, it is remarkable to note that it is absolutely possible. If not, maybe 2019. He’s been working hard at first base, trying to learn some of the nuances of the position. Getting help from a guy like Justin Morneau, who made himself into a very solid defensive player over his career, can’t hurt. He’s also spent some time in left field this spring. Twins fans, that player could be really good. I'm not the only one, but, I've been excited about this kid since the Twins drafted him. I'll be sure to make a stop in 'Nooga to see him play this year before he makes his inevitable jump to the bigs. Keep it up Rooker! I'm not smart enough to know whether he's a great prospect at this point, but I will say if he is and if he's a fast mover, the timing couldn't have been better for him. 1st base, if not open, is soon to be, and the corner OFers are all lh, including the top two backups. I think the story here is different enough to be hopeful about. There aren't a lot of college picks 30+ that speed through the minors and become good players. If teams think there's a chance of that, they're on them earlier. I don't think Will Clark and Rafael Palmeiro lasted beyond the first few coming out of Mississippi State. Fingers crossed. I'm also excited for Rooker. Hopefully he can continue to work in the corner outfield spots as well as first. Since he'll probably end up sharing time with Sano eventually. I was reminded when reading this of Morneau's introductory press conference. He mentioned how he was looking forward to working with Kepler as he'd noticed things in his swing/approach last year while watching the Twins games. I wonder if it was how he could help him when facing left handed pitchers. I guess we shall see! Could be Kepler's year! I began to get excited about Rooker last year and I love it when the good ones blaze through the minors in 2+ years or less.Those that do are special - Griffey, Trout...and I hope Rooker joins the list.Many of you know from my posts that I am always ready to move young players in rather than filling in with average vets. I hope that Lewis gets a good spring look too. I think this guy is going to be a stud. Don't know why, but I think he could be our version of Edgar Martinez. Thanks, Seth.I don't know of another player in the entire organization I am more excited about following this year.Well, maybe Thorpe.But I really will be surprised if we don't see Rooker with the Twins by September at the latest. And it’s not too late if any of you want to jump in! Most of the Twins best prospect have see time with the Big Club.Rooker is one I've wanted to see get some AB's but has not got called over yet.Maybe this week.I hope the Twins don't hold him back for the sake of he has to work through the system, I see no reason he doesn't start at AA.The Twins are light at 1b and the OF in the minors. The one additional thing I noticed seeing Rooker yesterday is that he really gets to anything in the middle of the zone and away, ball or strike and gets at it hard.The "word on the street" has been that he was a "launch angle" guy, but this is not really true, since he can get at balls on top of the zone and hit them for line drives with his compact swing. Where he has problem is in the inside pitches balls or strikes. He just cannot deal with either.If that second pitch was taken yesterday, then it was after striking out in his second PA by trying to swing at a ball that was about to hit his knee.Definitely fixable, but something to work on and I thought that it had to be noted. Huge future and the heir apparent to Joe Mauer, but he might need another year or so both with the bat and the glove at first. The Twins are light at 1b and the OF in the minors. RH OF for sure.They've got LH OF all over the system and will soon have no place to put them all. I think we are all going to really enjoy having Brent Rooker in a Twins uniform.BUT...how good is it to see Justin Morneau in a Twins uniform again?! Twins already have three excellent outfielders. I suppose Rooker could wind up as the forth come September. Bad news for Granite, Wade, Cave, etc. Bad news for Cleveland you mean! They're going to have to rename the award to Rooker of the Year. I am somewhat surprised by the universal helium around Rooker. Where are the negative people? Have to say, with that swing generating that power, I'm on board. The Twins seldom have good to great power hitter in the System.In the past I can think of Sano, maybe Vargas.Guys like Arcia,Rosario,Kepler,Parmelee were good hitters in the minors, but not with the type of power Rooker is showing. Lots of people jumping on the Bandwagon early! As I said (or meant), and I think I'm mostly right with this one, a hitter-first college player taken past the top thirty is rather unlikely to profile as we're hoping Rooker profiles. What's in the head of most people genuinely excited about Rooker is/was not in the head of the organizations that are in the know (nowadays more than ever). You don't generally pass on the guy the commenters have in mind. That's why I mention his story is somewhat different enough to be hopeful that maybe one slipped through, but I'm staying sober on this one until he destroys the upper minors and shows he can hit breaking balls. It's very rare for someone taken that low to make top 100 lists their first offseason, yet Rooker has, so it's not just Twins fans providing helium. The FSL is well known for suppressing power, yet Rooker hit 11 home runs in 40 games. Add some doubles to that as well and 42.5% of his hits went for extra bases. (yes, I know it's small sample). It's also worth noting that he was likely the best, or second best depending on how you liked McKay, college bat available. That guy usually gets drafted much higher (think guys like Bryant, Schwarber, Happ). His real issue was the lack of a position and that he really didn't show enough his previous year. I think the Twins made a very smart play taking him where they did. I liked that pick in June, and I still like it now. Personally, I just like that he seems to adjust quickly. He did that in the Appy and then again in the FSL. He's got some impressive power to go with a higher average and decent on base skills. This year will tell us if the helium is legit.